These are some of the typical questions we get about naturopathic and acupuncture treatment. There are also many questions that you will find answered just in the course of perusing our website. If you have further questions, please do not hesitate to contact us. What if I don’t live in Portland, can I still make an appointment? In order for Dr. Brody to be able to act in the capacity as a diagnosing and prescribing physician you would need to establish care face to face. She would then be able to follow up with you virtually if it would be appropriate for your condition and situation. Insurance usually does not cover virtual visits, but some plans do offer this. Feel free to ask our office staff about this. Dr Brody also offers coaching and consulting for clients all over the world. If you are looking for distance work, you can learn more or schedule here. How do I know if I should make an acupuncture appointment or a naturopathic appointment? We are able to address any condition with either naturopathic or Chinese medicine. Some people choose one or the other, and many of our patients at some point do both. As we have an individualized approach – tailoring plans for each patient based on his or her individual health goals, we will make a recommendation about your overall treatment plan once you are seen. In some cases insurance coverage exists for one or the other so please check your plan carefully if we will be billing for you. Your new patient appointment will take about 55 minutes, and you will most likely have several follow up visits of 30-45 minutes. Number of return visits will be determined by the severity of your health condition and your response to treatment. Although patients often feel better quickly, naturopathic care is about treating both symptoms and causes of illness. And although our goal is to identify and treat patients swiftly and effectively, as a rule naturopathic medicine is not a “quick fix, take a pill” approach to health care. If you are coming in for both Naturopathic care and Acupuncture, it is likely that your first visit will not include an acupuncture treatment. In order to address each patient’s needs comprehensively, the full hour is needed to gather information and formulate a plan. If you are interested in acupuncture only, your first visit will be an hour long with about 30 minutes of intake and a treatment lasting about half an hour. Follow up visits are typically 45 minutes. Often people ask how many visits they will need for the acupuncture to work. The truth is that it varies from patient to patient. Although in some cases, significant relief is obtained from one or two treatments, the effects are cumulative for most conditions. You can usually expect to start with a series of 8-10 treatments. In Oregon, many insurance companies provide policies that cover naturopathic services, but not all insured patients hold such policies. If your insurance does cover our services, our office staff is happy to submit your claim directly. To find out about your own coverage call your insurance company or read your policy. We will also confirm your coverage before you come in. Our full financial policy is included in our new patient paperwork that you can download here. Please note that often plans have in and out-of-network benefits and we are able to submit bills in either case! When patients don’t have insurance that covers our care we offer a 25% discount off of our regular rates. We are conscious about people’s financial limitations and our goal is to be as cost effective as possible with appointments and supplement recommendations. We accept checks, credit cards, and cash. Will you still work with me if I have a regular MD already? At ENHC we have a strong commitment to collaborative care. We are happy to work with you and your medical doctor or specialist to create a treatment plan that serves you comfortably and effectively. If you don’t have an MD primary care physician and would like a recommendation for one who will work with patients who prefer an integrative approach, please let us know. We have relationships with a number of primary care physicians and specialists who are more than willing to support your choice of complementary care. Can I use ENHC for my primary care? We provide most primary care services including physicals, annual exams, and care for most health conditions that don’t require a specialist. That said, as a rule we prefer that patients are under the care of a primary care group as well as working with us, as we don’t have physicians on call overnight or on Sundays, and we don’t have hospital admitting privileges as part of our scope in Oregon. Additionally, at ENHC we don’t administer vaccinations, do minor surgery, or male exams. If you have any specific questions about what we do, please give us a call. It can be, but it doesn’t have to be. At ENHC we have a practical and down to earth approach to your care. 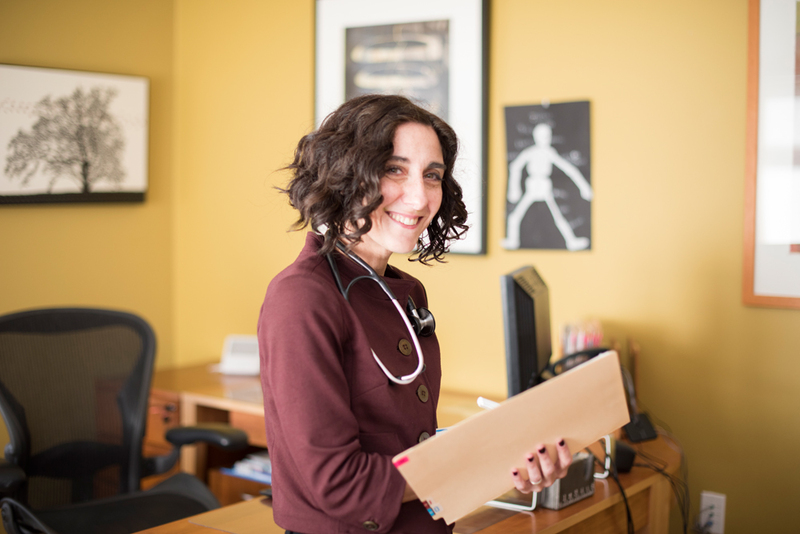 Our patients are a diverse lot and seek naturopathic care for a variety of reasons. Some prefer to have a whole person approach to health care, some have reached the end of what Western medicine can offer them, some want only nutritional counseling but are fine being on medications. We are here to provide health care that is in alignment with your values. Period. I’ve always been curious about acupuncture but I don’t like needles all that much. Doesn’t it hurt? Acupuncture needles are very thin and very sharp which allows them to enter the skin easily and with minimal discomfort. So thin in fact, when we tried it, 7 acupuncture needles fit in the hole in a medium gauge hypodermic needle we use for vitamin injections! When the needle is inserted, you may feel nothing or a sensation similar to a minor insect bite. Any discomfort usually subsides within a few seconds after insertion. After the needle is inserted sensations vary widely depending upon the person and the location of the needle, as well as the particular imbalance you are experiencing. It can vary from no feeling at all (in most cases) to mild aching or warmth. We believe firmly at Evergreen Natural Health Center that acupuncture does not have to hurt to work, and in fact, most often works better when it doesn’t. Acupuncture sessions should be restful and relaxing. In Oregon, Naturopathic physicians are licensed to prescribe most medications. The doctors at ENHC have a commitment to the approach that does the least harm and the most good, and in some cases this may include prescription medications. Upon occasion, there are medications that we may feel are best handled by a medical doctor or a specialist. We will inform you of this on a case-by-case basis. When we do prescribe medications, in almost all cases is it only part of your treatment plan. Given that many medications carry possible side effects, contraindications, and interactions with supplements and other medications, we require a minimum of a twice-yearly assessment for prescription refills with very few exceptions. How do I know you treat the problem I have? One of the great things about what we do is that it is helpful for just about any condition. Typically our patients find that after dietary and lifestyle adjustments, supplements, or other treatments that not only have we addressed their main concerns but also that their quality of life and energy is significantly improved. What do you think of x,y, or z diet (paleo, vegan, zone, south beach, etc.)? We believe that although there are basic sound principals of a healthy diet that there is no one diet that is best for everyone. We will make recommendations based on your family medical and personal medical history, current concerns and health goals. The short answer this is that from a western medical perspective we don’t really understand how it works. We do, however, have 5000 years of history of the medicine being used successfully for just about every medical condition. The science of Chinese medicine is a discreet science that explains its own theories through its own lens. A great introductory book on Chinese medicine is The Web That Has No Weaver. We strive to assist people in achieving a healthy lifestyle and yes, weight loss may be a part of that. AND, we firmly believe that just because you have fat on your body, it doesn’t mean you aren’t healthy. In most cases when we are able to identify the proper nutrition and exercise plan for an individual their bodies will automatically regulate to their healthy body weight. Things that can interfere with this process include a history of dieting, a sedentary lifestyle, and compulsive or overeating. Do you prescribe bio-identical hormone therapy? All of our physicians are trained in bio-identical hormone replacement therapy. We assess each person on a case-by-case basis to determine whether we feel that hormone therapy is indicated. Why is your intake form so long? We treat people as individuals, not diseases. This means that we need to understand all aspects of your health history, current health and health goals. With a comprehensive intake form we are able to focus on your concerns at your visit rather than reviewing each system individually. It makes your visit both more time and cost-effective. We know it’s long. Bear with us. You can request an appointment by calling (503) 977-0500 or if you wish, you can email us your phone number and we will give you a call. At this time we are unable to make appointments by email. New patients should complete the new patient forms (you can find them HERE) and bring them to your first appointment.